The installation of MLB The Show 18 took forever. Why make it take so long to start to play this baseball game Sony? MLB The Show 18 looks really good. Unless you play in that retro game play mode. Then it does not look as good. There are multiple difficulty settings so you can win or lose as often as you like. I enjoy winning like 14-1 if you know what I mean. My dad and brother had a good game here. I bought MLB The Show 18 myself since the Sony people were not capable of being professional. Nothing new there. I do feel MLB The Show 18 is worth forty dollars brand new. Nothing higher. I had to pay higher for this baseball game. 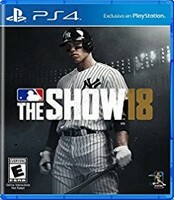 I also would like to see some competition for MLB The Show 18. The modes in MLB The Show 18 are New Roster Transactions, Conquer the Map, New Exchange Mission, Challenge of the Week, Play Now, Diamond Dynasty, Franchise, Road to the Show, Game History, Community Market, My Inventory, Vaults, Leaderboards, Media, Post Season, Home Run Derby, Retro Mode, and Options. Plenty of that is online game play modes. I will try really hard to have a review of MLB The Show 18 in issue #131 of the super Family Friendly Gaming e-magazine. There are ways to print it if you want a physical copy. MLB The Show 18 is a definite improvement over last year. I am glad I had all of the money needed to purchase this baseball video game. The price of MLB The Show 18 is a bit too high in my book.